Lan + Billy’s wedding was a humbling combination of a conventional Catholic and Chinese wedding. The two met a few years ago, starting with a friendship which progressed to love. Lan actually moved with Billy to Hong Kong, but they both decided to come back to Vancouver to hold their wedding. They spread their wedding celebration over the space of two days in order to fit both amenities in. Starting with a Chinese tradition; The Tea Ceremony. This is one of the most significant events. It includes a very formal introduction of the bride and groom, it aims to show respect to their families. The family then all proceeded to carry out a Catholic Blessing. This was held at St Francis Xavier Catholic Church. The traditions here include hymns, readings and of course prayers along with mass. They decided on a wedding film as well as our photography services, which is a documentary style, hour long film. It leaves you in awe, whilst you watch your whole wedding day from start to finish. Having a wedding film really allows us to emphasize and portray their love for one another. 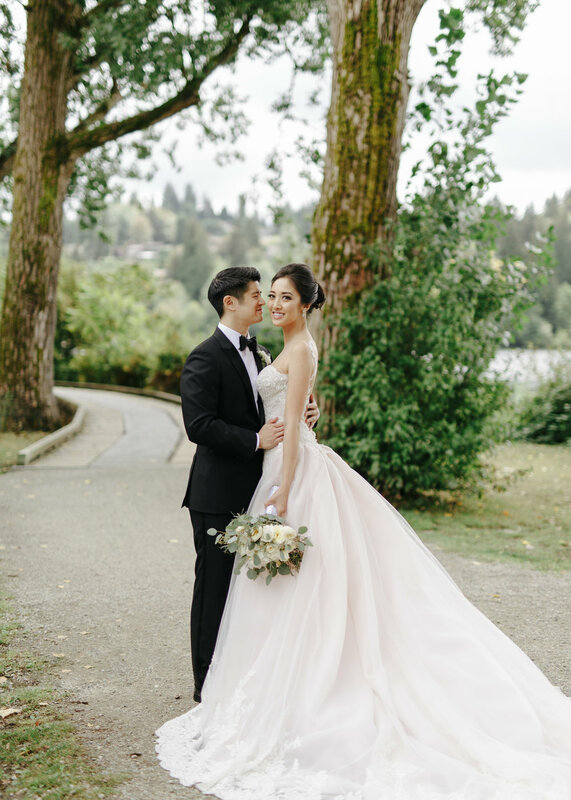 The couple began the day preparing at Element Hotel in Metrotown. Make up by Yuki. Colour scheme was a combination of gold, metallic tones, with shades of hot pink. A luxurious limo picked up the wedding party and took everyone to each location in style. The first look took place at the beautiful and quaint Deer Lake Park. Whimsical in the woodland. The Ceremony was held at the ever so wonderful Hart House’ a true favourite of ours. With the reception later being in the Hart House outdoor tent. - Making for an elegant and natural lighting combination. Floral and decor was light, airy with soft subtle tones to match the outdoor lawn. Provided by Kathleen Chiu/Proline Trading. Lan + Billy’s vows were really genuine and represented each other perfectly. Lan so sweetly said “I’ve been waiting for this moment my entire life...I wouldn’t have it any other way” whilst Billy described Lan as “a stunning beauty that my eyes will never tire from seeing!” How beautiful! The ceremony ended with a very beautiful and personal touch; a dove release. Provided by Wedding Wings. We had the portrait session as the sun set, overlooking the Lake across to the city. How wonderful are the shots? We feel they really capture the essence of the day. Thank you for a memorable celebration Lan + Billy! Late night food truck - Japadog. Event company: “Events to the nines” - Events To.The.Nines is a Vancouver-based event planning company with over a decade of experience in planning weddings, and other corporate events.